Amy Stansbury is an environmental reporter and journalist with a thirst for covering energy and local politics. 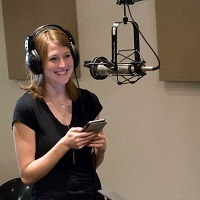 As the Editor-In-Chief of the Austin EcoNetwork, a local environmental news site, Amy has dedicated herself to teaching Austinites about the world around them. Amy has a passionate not just for telling the news, but for sharing it in a fun, creative, and entertaining way. Amy also loves to teach young people more about local civic life. With the Austin EcoNetwork she holds informational happy hours and produces podcasts about everything from how city council works to climate change. She is also a cohost of Shades of Green, Austin's only environmental talk radio show. In addition, Amy is Chair Elect of the Austin Young Chamber of Commerce's Economic Development Committee and a founding member of Generous Generation. In her free time she enjoys long runs along Lady Bird Lake and backpacking trips throughout Texas. She is so excited to bring her love of the outdoors and passion for community engagement to Westcave Outdoor Discovery Center.